Pandora, my personal IoC Container (mostly written for educational purposes) has recently been integrated into dotless. This has helped us improve the design of dotless without having to take on a big dependency like Windsor or StructureMap. I chose to implement Pandora through the Common Service Locator interface by Microsoft, so if we ever feel restricted by Pandora we can easily switch to a more potent container without touching the actual dotless code. This step also made me bring the Pandora repository from mercurial to git with some help from Horst. He was kind enough to run hg-fast-import for me. Pandora can now be found on GitHub with a similar build process as dotless and elms-connector. While getting into WPF and the MVVM pattern (you should check out this Webcast by Jason Dolinger if you need a tutorial to get started on MVVM) I found myself somehow dealing more with concrete classes then I was used to. Usually I hide everything behind some interface and try to think really hard before violating that habit. Nonetheless, ViewModel classes are just that, ViewModel classes very special to their View and you really can’t hide them behind a meaningful Interface (without looking too silly). It’s not completely meaningless after all, everything that keeps me from writing new PersonViewModel() somewhere in my code is just awesome. Only, it’s a bit too much of ceremony for something that simple. By asking for a concrete type you already tell Pandora everything it needs to know. So, now Pandora can resolve concrete types directly if there is no registration that says otherwise. If you ask for a concrete class A, you’ll get a concrete class A even if the container is totally blank. Now, if a class A is registered with the container it will use that one, if not Pandora will try to figure it out. That also leaves open one way of extending your system. You can start off with an implicitly registered concrete class A, and if you want to subclass it later to modify behavior you only register the new subclass B as implementor for service A with Pandora and you’re set. 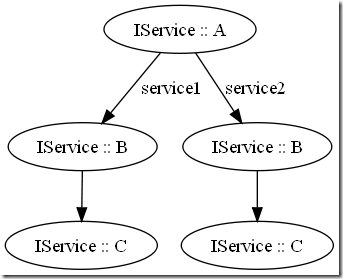 The dependencies of the requested type can be satisfied. Also keep in mind that the default lifestyle for Pandora is singleton, so once you request A, you’ll always get the same instance back as long as you don’t change that through an explicit registration. As always you can grab the source from the BitBucket site. There is no new binary release (I only moved up a minor version), but compiling Pandora is a pretty straightforward process as long as you have Visual Studio installed. Ps: I was amazed how easy it was to implement this. Basically all I did was write a wrapper around the ComponentLookup service to implement the new functionality. It’s all in one place :). I finally decided it’s time to release Pandora. The current build is stable and meets all of my current requirements, so I feel the best way to advance Pandora is to dogfood it on another project. Also, this gives me a bit of an opportunity to catch up on the documentation side of things and work out bugs that may be there. I still have a pretty interesting wish list (Generics, Factory Methods, AutoConfiguration), but those features are all rather non-trivial and I feel Pandora should stay a simple and minimalistic container right now. You can download the compiled Pandora release from Bitbucket or you can grab the source and compile it for yourself. Just run the build.bat script and NAnt (supplied within the repository) will fire up and compile everything into the build\ directory. By default the script will also compile and run the accompanying unit tests, leaving you with a Pandora.Test-Result.htm file you can then review if you please. 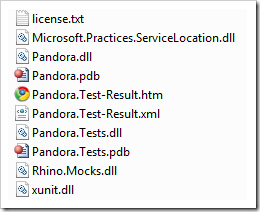 To compile without tests simply run “build compile”, and you’ll end up only with Pandora.dll/pdb and the common service locator library. RFC: Is a supplied factory method useful for an IoC container? Does it make sense to have something like this in a DI container? The idea being, you can supply a function delegate (Func<IPandoraContainer, T>) to be executed when the service should be instantiated. This would make a rather interesting extensibility story, since I’d avoid having to build in all kinds of hard to find hooks to allow modification of the object creation. Also, I’d like this delegate to be evaluated during runtime. This could enable me to resolve to another object if for example a network link is down etc. What do you think? Should this make it into Pandora? What do you want to see in a DI container? Please feel free to comment. I never tested if Pandora can handle generic types!! The moment you define what generic type you are using, a generic class is just a regular class that can be used like all the others. This way I can specify in one registration what types I want the generic to serve and the Fluent interface will create a distinct registration for each type in .OnlyForTypes. This way I don’t need any reflection code in the resolving part of Pandora. You can find the source to Pandora at the project website on Bitbucket. There are times when your services depend on an object you can’t construct yourself. One obvious example being the HttpContext in most ASP.NET applications. I just finished refactoring Pandora to have a much cleaner configuration and also to enable lifestyles for certain components. Until now, Pandora was not able to save one service after it’s initial activation. Every call to container.Resolve() would instantiate a new service with new dependencies etc. It may be of interest to some of you that this is the exact opposite of the default lifestyle Windsor sets for it’s components. So I obviously wanted to change that. All “logic” concerning a lifestyle is completely enclosed in the Lifestyle classes so creating a new lifestyle for Pandora should be rather simple in the future. But the real big news (and the real big change) is the changed configuration. At first I tried to bake a fluent interface into the Registration (the class Pandora uses to represent one registered service) to allow nice parameter syntax. The idea was good, but it led to some problems with the interface and also made it much harder to consume those registrations inside the container. I then decided to rip everything out and revert the registration to a dumb value type that only holds information that can be easily serialized/deserialized if needed. As before, this looks intentionally familiar to Windsor users, since I believe Windsor’s interface is really good and makes a lot of sense when reading. What I improved upon (at least, I believe so) was to get away from the static Component class Windsor uses to bootstrap the Fluent registration, but to use a closure that provides Intellisense right from the beginning. Meaning, in Windsor there is no Intellisense when you Write: container.Register() .. From the signature you can only see that you need an array of IRegistration while nobody tells you that you need to use that static class that’s buried down in Castle.MicroKernel.Registration, while writing p. instantly brings up all registration options in Pandora. Next in line is improving the fluent interface even further to allow for auto-configuration (eg. take Assembly A and register all Types in there). Another challenge I want to tackle with Pandora is externalizing the configuration. Fluent interfaces are awesome for developers (since they allow easy refactoring), but the real power of a DI container also comes from the ability to change the configuration without recompiling the app. Usually all containers solve this through XML, so I’d like to try a new approach here and am currently thinking about making Pandora read the configuration from a IronPython script. That would allow me to consume the Fluent Interface without recompiling the application and paying the XML bracket tax while retaining the flexibility of just opening up a text file to change my configuration. As usually, you can find the source to Pandora at the project website on Bitbucket. In case you haven’t heard. Some time ago Microsoft sat with most authors of leading IoC containers and defined a common interface for Dependency Injection / Service Location. You can get all the relevant information about the Common Service Locator through reading Glenn Block, Ayende Rahien or Chris Travares and you can download it from it’s Codeplex site. There is a comprehensive API reference in their wiki too. In Pandora I aimed for CSL compliance from the beginning, and the CSLAdapter class has been there for quite some time now. But since Pandora only recently got the named lookups feature I never finished it. Until now. Today I finally implemented the CommonServiceLocatorAdapter that (for me) somehow “verifies” that Pandora supports most mandatory lookup features needed from a DI container. On the implementation side: I first tried to implement IServiceLocator directly, until I discovered the abstract ServiceLocatorImplBase class that wraps all of the overloads and generic/nongeneric stuff, saving you a bunch of boilerplate code. Coming up next in Pandora will be component lifestyles, forwards and then maybe DLR configuration. One rather essential feature for a DI container is to be able to lookup components by some key. For example retrieving a specific IController class based on the controller name specified by the request. Well, yes Pandora can do those kinds of things too. If you know Windsor’s Fluent interface .Parameters().Eq() may sound familiar to you. That’s intentionally. I like the Windsor Fluent syntax. What I really underestimated was how to do the fluent interface. It’s not terribly hard, but it’s takes some tinkering ;).